Although I’m personally long nat gas, I decided not to add it as an official trade idea because I’d prefer to see the charts firm up a bit more before doing so. Although my entry was based on what I think was a sound technical case, it was most certainly an aggressive, ‘catch-a-falling-knife’ trade. Fortunately, or at least so far, I was able to go long right at the lows yesterday, with that entry & reasoning behind it posted here in trading room: http://rightsideofthechart.com/members/pkm48193/activity/22561/#acomment-22562 ). I also would like to thank several other members, including @pkm48193, @joefriday & others that for keeping nat gas on my radar with their recent analysis & updates on nat gas within the trading room. That entry yesterday was and still is based on attempting to catch a possible bottom or at least play an “oversold, off support” bounce trade and so far so good. 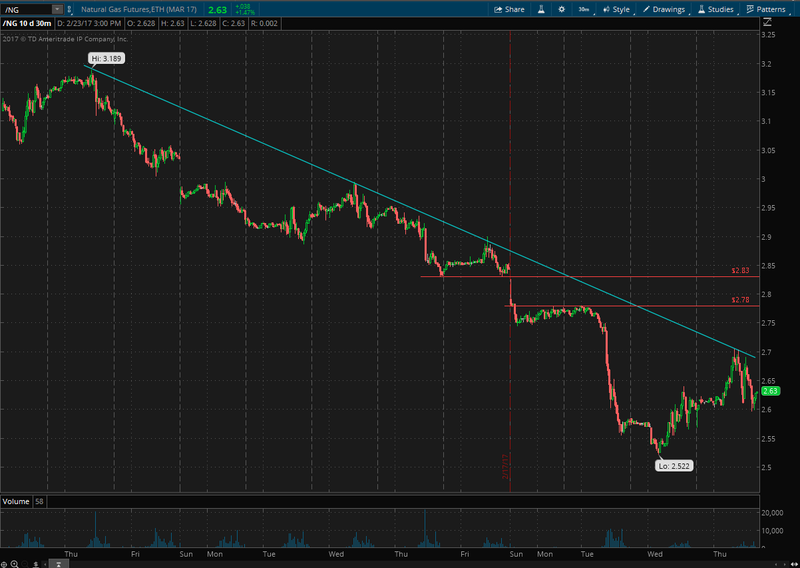 /NG (nat gas futures) hit a low of 2.522 right around the time I made that post in the trading room yesterday but it is still too early to say that the bounce off that 2.55-2.50 support level is anything more than a dead-cat bounce at this point. As such, I’m going to let the position ride for now with a stop slightly below 2.50 with two tentative price targets at 2.78 & 2.83 (those are the actual resistance levels, my sell limit order(s) will be placed slightly below if I decide to book partial or full profits if /NG gets there). Those resistance levels, along with a potential downtrend line that could be the catalyst for the next thrust higher if taken out, is shown on the 60-minute chart of /NG below, along with a daily chart of $NATGAS (Nat Gas Continuous Contract) printing a nice doji off a comparable support zone* ($NATGAS prices will differ from /NG futures, which are often priced at a premium or discount to spot prices). Also note that $NATGAS is an EOD (end-of-day) chart. Therefore, the $NATGAS chart below only reflects yesterday’s closing candle & not any of today’s trading. Thanks.What would 2.78 translate to on UGAZ? Hard to correlate 2.78 on /NG to the comparable level on UGAZ since UGAZ didn’t trade on Monday due to the President’s day holiday (hence, no charting history to correlate to) while /NG, as a futures contract, did trade on Monday. 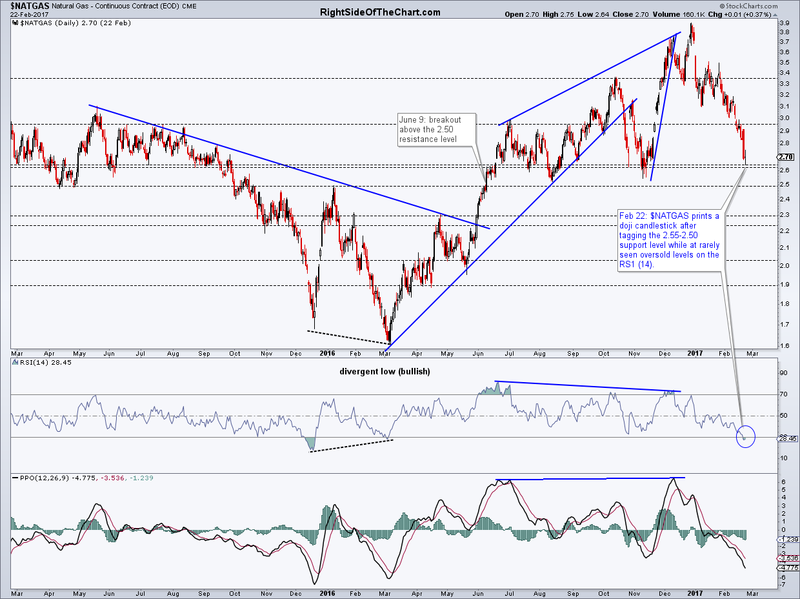 My best guess would be around ~17.50 while the 2.83 level on /NG (next key resistance) correlates to about 18.90 on UGAZ. Maybe. The big players in the market (professionals) will typically trade futures vs. the leveraged ETFs. As such, even when trading the leveraged ETFs myself in lieu of using futures, I’ll keep a close eye on the charts of the futures to help hone in on my entries & exits. Are you in Futures, ETF or 3xETF or options? Although I’ll use /NG at times, depending on which account (IRA vs. trading/margin acct) or the total exposure that I want to nat gas, I used UGAZ this time around as I figured nat gas would either bounce off that support zone, likely providing a quick in & out bounce trade only lasting a 3-5 or so sessions or continue on through it, thereby stopping me out relatively quickly. I’m still relying on the /NG charts for my analysis, especially since UGAZ has a fat void (gap) of “missing prices” since as an ETN, it didn’t trade on Monday while /NG did.